Prime Minister of the Kurdistan Regional Government in Iraq, Nechirvan Barzani (L) speaks to VOA's Ali Javanmardi (R) about various regional issues. In a lengthy and wide-ranging interview, Kurdistan Regional Government Prime Minister Nechirvan Barzani spoke to VOA's Ali Javanmardi at his office in Irbil about plans with the U.S. to regain control of the Iraqi city of Mosul from Islamic State fighters, as well as about Kurdish independence and the attempted coup in Turkey. This conversation was translated from Kurdish and edited for clarity and length. VOA: What role will the Kurds play in reclaiming Mosul from Islamic State militants? Nechirvan Barzani: Mosul is close to Irbil and Dohuk, and can greatly impact Kirkuk. Therefore, the liberation of Mosul is very important for Kurdish Regional Government [KRG]. Our Peshmerga forces will have the central role, and we coordinate with Baghdad, the international coalition, and particularly the United States. We are at the planning stage. VOA: There is a great deal of anxiety about more refugees coming to Kurdistan once the Mosul operation starts. What preparations are underway? Barzani: As you know, the KRG is experiencing a serious economic crisis. In spite of that, we have created a center within the KRG Ministry of Interior that is in contact with the United Nations to plan for the flood of refugees. We have selected certain regions to create camps for refugees. Recent estimates indicate about 500,000 new refugees will come to the KRG. We are working with Baghdad and looking forward for assistance from the international community. At this time, we anticipate receiving refugees from Makhmur and Shargat. VOA: How long do you anticipate the operation in Mosul to last? Barzani: In the operation to liberate Fallujah, Diyalah … we anticipated much more resistance. If the trends are what we have seen, I do not think the operation will take long. At this time though, liberation plans are not ready yet. FILE - Kurdish Peshmerga forces fire a weapon during clashes with Islamic State militants in a village east of Mosul, Iraq, May 29, 2016. VOA: Why is the operation still in the planning phase? Barzani: There are two reasons … From the military and security point of view, who will control the city in the future? The control of the city must be carefully evaluated. In my view, who controls the city after the liberation is of utmost importance. Aside from this, the Iraqi Army is not adequately ready and could take months to get ready. VOA: What is the content of the KRG's agreement with the United States regarding Mosul? Barzani: The agreement contains two parts: The first is devoted to the financial contribution of the United States to the Peshmerga; and the second part is a military protocol between the United States and the KRG. According to this, the military contribution should be given directly to the KRG and no one else. … The protocol has been signed by both sides. Additionally, the agreement covers the cooperation and coordination between both sides for liberation of Mosul and other regions captured by Daesh [Islamic State]. VOA: There was a report that Qasem Soleimani, the commander of Iran's Revolutionary Guards Quds Force, asked Nouri al-Maliki, president of Iraq's ruling Islamic Dawa Party, to block the U.S.-KRG agreement, and that he does not want U.S. military bases in Iraqi Kurdistan. How much coordination did you have with Baghdad on this agreement? Barzani: I am unaware of this information. I do not believe it is correct. VOA: Is Baghdad aware of the content of this agreement? Barzani: We informed Baghdad in advance. I think the U.S. had also informed Baghdad of this agreement. The agreement is not new. It is the result of many meetings and months of exchange of views between us and the Americans. VOA: You previously indicated that Islamic State resistance has weakened. What is your plan if IS is defeated? Barzani: It is possible following the liberation of Mosul that Daesh will not have any territory to continue its "caliphate." But in my view, Daesh will remain a terrorist organization, only their tactics may change. Now, we have territorial confrontation with Daesh, but [after their defeat] it will create secret cells and will start a guerrilla war in Iraq. Iraq has no military solution for the dilemma of Daesh. It is necessary that this phenomenon be studied thoroughly from a political aspect in the hope of finding a solution to eliminate it. VOA: Assuming that the political problem of Islamic State is eliminated, what is the future of Kurdistan's independence efforts? Barzani: The independence of Kurdistan is the right of our people. Choosing our destiny is a legitimate right and will remain a goal for us and all the Kurdish people. What is important for us after Daesh is Kurdistan's borders. We will decide the extent of our borders by what has been liberated with the blood of our Peshmerga. … Whether we remain with Iraq or be independent or be a part of a federation or confederation, our priority will remain the delineation of our boarders. VOA: Once your borders are set, do you think your two principal neighbors, Iran and Turkey, will oppose your independence? Barzani: Whatever decision we arrive at — independence or confederation — Baghdad will remain our strategic partner. We will discuss these problems with Iraq. At this stage, neither Ankara nor Iran will be the deciding factor. We will solve the problems through negotiations with Baghdad. FILE - Pro-government demonstrators wave Turkish flags as they protest against the attempted coup in Istanbul, Turkey, July 19, 2016. 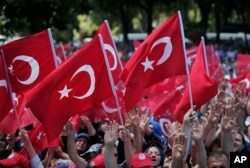 VOA: The failed military coup in Turkey that led to vast arrests. What is your position? Barzani: I am happy for the victory of the people. If you look at the history of military coups in Turkey, you will find … all military coups have had dreadful consequences for the Kurds. The KRG is happy that the Turkish people kept in power a government that received its legitimacy from its nation. 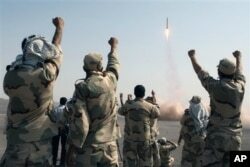 FILE - In this photo released by the Islamic Republic News Agency (IRNA), members of the Iranian Revolutionary Guard celebrate after launching a missile during their maneuver in an undisclosed location in Iran, July 3, 2012. VOA: One of the important problems for KRG are the activities of Iran's Kurdish Peshmerga and their confrontation with the Revolutionary Guards in Iranian Kurdistan. Many of the Revolutionary Guard commanders — among them Mohsen Rezaee — as well as some Islamic Republic authorities have claimed that these activities are supported by Saudi Arabia through Kurdistan. They claim that Saudi Arabia has created a training center for Kurdish Democratic forces of Iran in KRG and that you ignore it. How true are these accusations? Barzani: These claims have no foundation. Saudi Arabia, like other countries, has a consulate here and acts within the set protocol with Iraq, and is engaged in diplomatic practice. The accusation that the Saudis sponsor a training center here is far from the truth. Our friendly relations with Iran are very important for us. In the past, we have proven that we have been a factor of stability, both for Iran and Turkey, and in the past for Syria. This is the framework of our foreign policy. VOA: A final question: On the streets of Irbil, people talk about the economic crisis facing the KRG. What steps have you taken to address this? Barzani: Certain events caused this crisis for the KRG. First, in 2014, without any previous consultation, Baghdad cut our budget. Second, the war with Daesh. We have a 1,100-km border with Daesh. Up to now, we have lost 1,500 Peshmerga and more than 8,000 have been injured. Third, there is the arrival of 1.5 million refugees and internally displaced persons from Syria and inside Iraq. These followed one after the other. In addition, the price of oil dropped considerably, increasing the seriousness of the crisis. We have tried to stop this crisis. … We have reduced our government expenses. However, we need foreign assistance to ride out this crisis. We are discussing remedies with the World Bank, the IMF and Baghdad. All these efforts must go through Baghdad. Unfortunately Kurdistan has no priority in Baghdad. VOA's Persian News Network contributed to this report.